As demonstrated through its recent sponsorship of HackGT 2017 in October, NCR is increasingly a company dominated by software. With NCR’s shift to software comes big changes — in both mentality and location. After joining NCR in 2005, Chairman and CEO Bill Nuti began a 15-year reinvention of the company in order to raise it back to profitability, pouring money into software R&D and improving manufacturing capabilities. The most recent development is NCR’s move from its current headquarters in Duluth, Georgia to a new headquarters on Spring Street in Technology Square, where it will have over 500,000 square feet of office space. Economic analysts at Invest Atlanta, the city’s official economic development agency, believe the new Midtown headquarters could have a $1.2 billion economic impact on the city of the Atlanta itself. Nuti, aware of the growing startup and technology culture that is present in Atlanta, has dubbed the city “the Silicon Valley of the East,” and wants NCR to be a part of the core of Atlanta’s growth to achieve that vision, according to Rosner. “Our move to our new headquarters in midtown Atlanta … is huge for us in terms of talent, and we collocated ourselves next to Georgia Tech, that has very strong faculty and schools, like the College of Computing, the College of Engineering, [and programs in] computer science, machine learning, and data,” Rosner said. 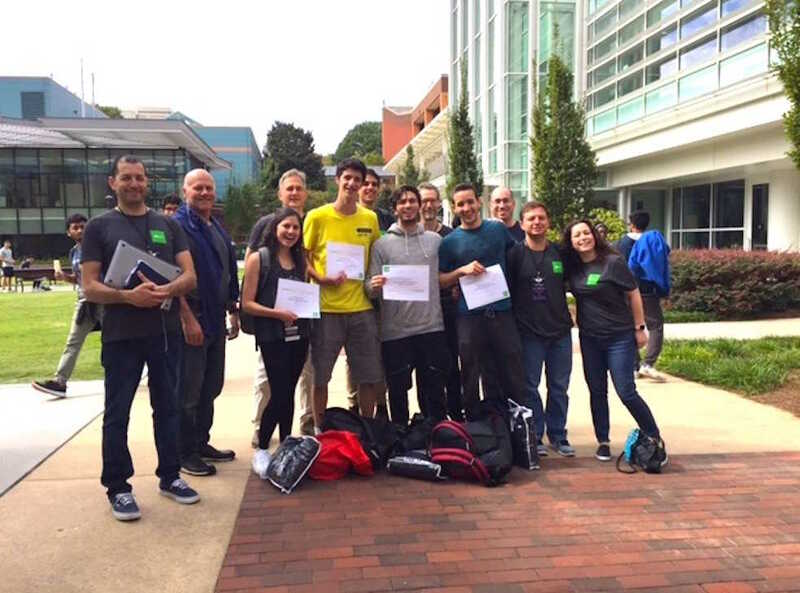 While NCR has sponsored multiple hackathons around the world in the past, this year’s HackGT was the first time that NCR has used a hackathon as a method to premier a new software platform. For the three days of the hackathon, students became the first third-party users of NCR’s Omni-Channel Decision Support Platform (ODSP), which will formally debut next year through a Developer’s Portal. When released, the ODSP will allow NCR’s customers to interact with consumers through devices ranging from mobile phones to NCR touch points. The ODSP is composed of five different APIs that each serve a distinct purpose: Catalog, which organizes all of the items that a vendor sells; Messaging, which tracks recent consumer engagement; Ordering, which allows customers to use any device to order products through the cloud; Program Execution, which manages both NCR and third-party loyalty programs; and Transaction Document Management, which records transactions. The thread connecting each of these APIs is data — data on what the sellers have, and data on what the consumers want. “Probably 800 million transactions every day flow through our NCR edge points all over the world,” Rosner said. “There’s massive amounts of data. And us serving multiple services — hospitality, retail and financial — it gives us a huge opportunity to look at the consumer. “Where they eat, shop, bank, and travel, and construct a database of consumer preferences that can truly help our customers increase their engagement with consumers,” Rosner continued. So, NCR generated mock catalog and transactional data and gave them to students who chose to use the ODSP to develop their hackathon projects. Sendis, the winner of Best NCR Platform Idea at the hackathon, combined computer vision on a mobile platform with NCR’s API in order to allow users to take a photo of an object around them and purchase it online. Other hackathon groups used NCR’s platform to enable food ordering and delivery by drone, to manage warehouse inventory with the help of augmented reality via HoloLens, or to generate infographics on consumer activity by running natural language processing on NCR data. In total, twenty teams used NCR’s ODSP during the hackathon, both giving NCR a sense of the breadth of what was possible with their API as well as valuable direct feedback, such as the desire for code examples in multiple programming languages, Rosner said. Both the official NCR Twitter profile and CEO Nuti tweeted on Oct. 19 that several students leveraged their platform, showing how news of the hackathon is related to the conversation on even the highest rungs of NCR. After about a day and a half “with a lot of diagrams and whiteboarding,” Rosner says that the teams then take the next 90 days to prototype with Scrum method in order to validate their ideas. If it’s infeasible, it’s scrapped or delayed until the future. However, fifty percent of the time, the ideas work out and go into production within the next six to eighteen months, Rosner says. In a sense, the 90-day challenges are like mini-hackathons played on a corporate scale: trying out innovative ideas, and running with the ones that show promise.